With the cord cutting revolution going on full throttle, it is becoming more and more common to choose software solutions over cable connections. One such example of this is the increasing usage of VoIP software among businesses. Built for flexibility and convenience, these platforms offer a full range of features that will allow you to facilitate conversations with your customers and teammates. On top of that, these are often cheaper compared to traditional phone systems, making them great for small businesses. However, choosing a VoIP phone system for small office that blends well with your operations can be challenging. To help you out, we will be providing you with in-depth explanations about the different functionalities of these software solutions as well as give you a rundown of some of the top solutions available on the market. Effective communication is an important factor in building strong relationships with your customers and improving team collaboration within your workplace. However, managing conversations on different channels can become taxing especially for small businesses with limited manpower. Because of this, businesses need comprehensive tools such as VoIP software systems that will help them unify these channels and optimize how messages are received, routed, organized, and archived. As alternatives to business phone systems, VoIP gives users the power to leverage multiple modes of communication in a single interface. On top of that, these applications are equipped with tools that allow you to perform intelligent call routing, advanced voicemail to email transcriptions, as well as business call history reporting. This is why it comes as no surprise that businesses are increasingly choosing this over the more traditional applications. As you can see on the table below, entrepreneurs are switching to VoIP for their businesses because of their reliability (17.4%), affordability (14.92%), and conduciveness to company growth (14.92%). Aside from simplifying the management of calls and messages, VoIP phone systems also offer great savings in terms of money, time, and effort. In fact, businesses can reduce costs by about 50% to 75% if they decide to use VoIP systems instead of legacy PBX. These communications solutions can also help businesses save 191 hours a day. Whether it’s a simple startup or an established enterprise, your company can thrive or fail depending on how well you can communicate internally and externally. If you would like to learn more about the importance of VoIP and its numerous advantages, then this guide is for you. With this article, you’ll be able to make a well-informed decision when selecting the ideal program for your company. Now that you know what to look for in this type of application, you can start narrowing down the most suitable options for your operations. To help you choose a VoIP phone system for small office, we have listed down 10 examples that you should consider. These are all known for having easy-to-navigate, flexible, and scalable interfaces that make them great for startup companies and small enterprises. Of course, you need not limit yourself to choosing from the products we’ve mentioned. There are other great VoIP platforms on the market in case none of the applications below meet your preferences. You can start by checking out our article on the top 20 business phone systems of 2019. RingCentral is a cloud-based phone system built to simplify business communications. Equipped with an extensive set of VoIP features, this platform can facilitate online meetings, accept phone calls, and receive text messages in a single interface. It comes with tools like audio and video conferencing, call monitoring, collaboration tools, and reporting solutions in order to help you get full control over your communications efforts. It can also be integrated with other business systems such as Zendesk, Microsoft, and Google for a more streamlined workflow. Compared to many of the other products mentioned on this list, RingCentral offers the most sophisticated PBX system and comprehensive communications tools. It provides easy-to-maintain and configurable features that can be tailored to the unique needs of your business. The system also offers impeccable fail safe measures in case of internet connection problems to ensure business continuity. With this, you will surely be able to extend your reach and organize your communication efforts effortlessly. For pricing, RingCentral offers different plans depending on the number of users you plan to enroll in the system. These may be billed annually or monthly and can range from $19.99/month/user to $49/99/month/user. The vendor offers a comprehensive free trial to get you up to speed with the features. You can sign up for the RingCentral free trial here. PanTerra CloudUC is a scalable, enterprise-grade communications platform that leverages the power of PBX systems, team collaboration applications, contact management tools, and unified messaging software. It helps you unify your different communication channels so that you can manage all of them in one place and make sure that no messages are overlooked. Aside from its comprehensive features, this platform also supports multiple integrations, making it highly configurable. Should you be interested in investing in this software solution for your business, be sure to contact the vendor. They only offer quote-based plans to ensure that you are getting the set of features you require at rates that fall within your budget. You can easily sign up for a PanTerra CloudUC free trial here and get to know the features firsthand at no cost and without commitment. Comcast VoIP is a cost-effective solution created to help businesses drive growth by simplifying communication efforts. With this, users can manage messages on the go or in the office, allowing them to immediately respond to customer calls, never miss teleconferences, and the like. Some of its notable features include automated attendants, business voice continuity, business call history, and disaster recovery. On top of that, it is equipped with a Primary Rate Interface trunking tool that lets them use their existing PBX system as a fail-safe in case of emergency disasters. The vendor also offers reasonably priced subscription packages depending on the kind of functionalities you require. These packages can cost anywhere between $29.95/month/line and $499.95/month. 8×8 VoIP Phone Service is marketed as a flexible, easy-to-use cloud PBX that allows users to manage communications wherever they may be. Trusted by businesses from different industries, this platform offers robust phone system functionalities, business features, collaboration tools, and online management options. With it, you can facilitate teleconferencing, simplify call routing, conduct online meetings, as well as optimize the monitoring of operations. On top of that, this software solution may be deployed via cloud or on-premise. As for subscription rates, 8×8 VoIP Phone Service offers quote-based plans, so be sure to contact the vendor. Slack is a messaging platform that provides teams with ways to collaborate more effectively. Serving as a unified communication hub, this application makes use of private groups and conversation channels to reinforce your operations. It also supports file sharing, advanced data filtering, robust data security, and configurable notification options. To make it even better, Slack can blend seamlessly with more than a thousand third-party applications. The only downside to this software is that it’s not built for communicating with customers. If this won’t be an issue for you and would like to give it a try, you may use the basic functions of Slack completely for free. As your needs change, you may choose to upgrade to any of their paid plans which cost $6.67/user/month to $12.50/user/month. Quote-based plans are also available. Skype is a communications platform that can support instant messaging, video chat, and international calls. Known for its simple yet comprehensive set of features, this platform allows users to hold conferences for up to 250 people, integrate with third-party business apps, contact landlines and mobile phones, as well as manage messages on mobile devices. It also has a familiar interface and low learning curve that makes it great for users who are not tech-savvy. To top it all off, the basic form of Skype is available for free. Should you need more advanced features, they offer paid plans that range from $5.50/user/month to $12.50/user/month. Formerly known as ShoreTel Sky, Mitel Sky is a cloud-hosted PBX that consolidates all business communication processes. With it, you can handle phone calls, video conferencing, web sharing, mobile communications, customer engagement, and telecom administration. The system also offers internal messaging options that can help you keep employees engaged and in-the-loop about current projects. Moreover, it comes with robust business intelligence tools that let you make sense of your productivity data, call trends, and the like. If you think this VoIP system is the right fit for you, get in touch with their representatives to get a quote. This way, you can get a subscription plan that is tailored to the unique needs of your operations. Google Hangouts is an application created to help users initiate conversations in different communications channels. Be it voice calls, instant messaging, or video chats, this tool can easily provide you with what you need to get in touch with customers as well as your employees. Offering an easy-to-navigate and mobile-ready interface, this platform offers custom administrative control options that let you program it according to the needs of your business. It can even integrate with other applications so it is easy to extend its functionalities. What makes this even more ideal for small businesses is that it is available completely free of charge. Zoho Cliq serves as an all-in-one platform for real-time chat, audio and video call, as well as teleconferencing. Used by businesses of different sizes, this software solution can be used to improve team collaboration. It is even equipped with file sharing, slash commands, and task bot automation to help users consolidate all the information they need for projects. Moreover, it has great security options that include SSL encryption and multi-protocol support. If you are interested in investing in Zoho Cliq, the vendor has a free edition that is great for small businesses. As your company grows, you may opt for their Unlimited Edition plans that cost $1/user/month to $3/user/month depending on the number of users you have. The more users you have, the cheaper the plan will be. CloudTalk is a call center software created specifically for small and medium-sized businesses. Built to accelerate and improve customer support operations, it allows you to make international calls, perform advanced call routing, and record calls for future reference. It also provides you with real-time access to customer information during calls to further optimize each conversation you have with clients. In addition to that, it can tightly integrate with a wide variety of other business systems such as CRM systems, ERP platforms, and eCommerce applications. For pricing, CloudTalk provides four pricing plans that are bundled depending on the number of agents you intend on onboarding as well as the kinds of call center software tools that you require. Prices range from €19/month to €149/month and they offer discounts for those opting to pay on an annual basis. The vendor also offers a custom plan that is available by quote for your convenience. 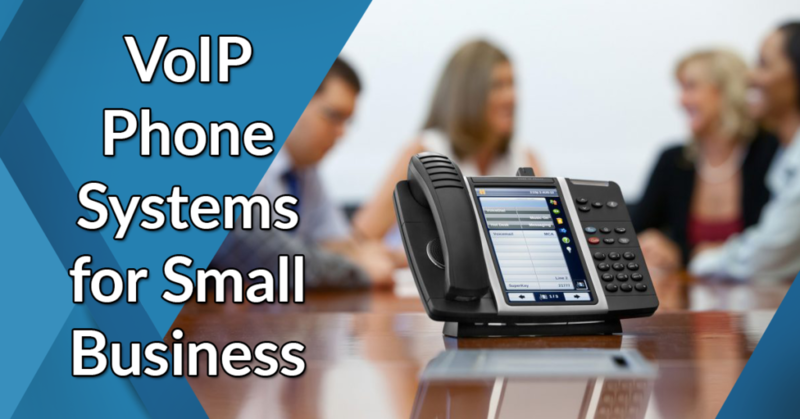 Why Should Small Businesses Opt for VoIP Systems? VoIP was created in order to do away with expensive cable connections in business telephony. To implement a VoIP system, all you’ll need is a broadband connection, a router, a computer that will act as your PBX server, IP phones, and the software. This not only simplifies how companies can manage their communications but also minimize implementation and maintenance costs. Moreover, VoIP systems will allow you to use your existing hardware rather than buying new ones. Just make sure that the product you invest in is compatible with your hardware. VoIP systems are generally low maintenance. Most providers include service costs in their rates and provide you with the assistance you require to keep the program up and running at all times. This way, you won’t need to have technical expertise or hire an expert to manage troubleshooting, repairs, and other maintenance issues. However, it is important to note that this is not always the case for all VoIP solutions. More often than not, self-hosted and on-site VoIP applications won’t offer this. In this day and age, there are plenty of communication channels that you can utilize for your business. Be it through phone calls, video chat, instant messaging, email, or fax, it is crucial that you give your customers the option to contact you using whichever method they prefer. Using VoIP systems, you can accommodate all of these and simplify them as well. These tools are equipped with centralized administration tools as well as multi-channel support. This way, you won’t have to jump from platform to platform in order to communicate with your clients or your teammates. If you and your staff members are always working on the fly, then using a VoIP will be a boon for you. This software only requires internet access and a device through which you can manage your messages, making it easy to receive calls, respond to IMs, conduct video chats, and the like even while you’re out and about. More often than not, VoIP systems are completely mobile-ready. This means you can make use of the full capabilities of the program using just your smartphone. Valuable company information passes through business phone systems on a daily basis. This is why it is important to ensure that your communication channels are protected from prying eyes. Using VoIP, you can be sure that you are facilitating conversations in a secure platform. Unlike traditional telephone connections, these modern programs offer robust encryption protocols, password protection options, and other security tools. RingCentral offers an intuitive dashboard that can boost communication between your business and customers. No two VoIP systems are alike. They all have differences in sets of features, types of communication functionalities, and the number of integrations they can support. For small businesses, we highly recommend that you find a VoIP software solution that will provide you with the features we listed below. These are all necessary to make sure your communications efforts run as smoothly as possible. Speaking with two or more people at a time about the same topic can get complicated. This can make it difficult to keep track of the progress of your conversation and can even lead you to overlook certain aspects of what you have already talked about. This is where conferencing capabilities comes in. As one of the most common functions of VoIP services, this tool allows businesses to conduct phone or video calls with multiple people at a time. With this, you can speak with different internal or external participants in a single platform and even share documents, photos, videos, audio, and other files as you have your conversation. There are all sorts of information that a company can get by monitoring calls and messages that pass through their VoIP phone system. To help you keep track of this data, a business call history feature is needed. Using this, you can get a better picture of the nature of the calls you frequently take, the demographic of the client pool that contacts you the most, as well as the amount of time and money you are allocating for communications on a daily basis. With this information right at your fingertips, you can easily determine how to adjust your communications strategies. Many owners of small businesses and startup companies don’t have the liberty of staying in their offices the whole day. More often than not, they go to different client meetings, visit their suppliers, or even work from home from time to time. To make sure that you are able to accommodate all of your calls, you can utilize the find me/follow me call routing. This feature lets you program the software to reach you using different numbers such as your office phone, home phone, and cellular phone before it pushes the call to voicemail. Always having trouble jotting down names and contact numbers from voicemails? By using this feature, you can automatically transcribe your voicemails to emails. This way, you can file, organize, delete, and search voicemails without having to spend time listening to each message. Not all small businesses can afford to hire receptionists and attendants.To help you make sure that all of your calls are being directed to the right staff members, having an automated attendant will come in handy. This feature allows users to accept, queue, and route calls and messages to the proper extension. By doing so, you can save time and energy without compromising the efficiency of your operations. For small businesses with limited staff members, it is important to maximize employees in such a way that they can each take care of multiple aspects of their operations. Because of this, it is not practical to simply assign one person to stay in the office to answer calls and messages. In these cases, having a VoIP system with a mobile-ready interface is crucial. This will allow businesses to utilize the different functions of the VoIP phone application in their smartphones and tablets. By doing so, they can easily monitor and manage incoming calls and messages with ease no matter where they may be. As your business grows, you’ll find that one of the most taxing aspects of managing calls and messages is the administrative tasks that it entails. By having a VoIP phone system with an intuitive dashboard, you can easily keep tabs on these responsibilities. This will give you a bird’s eye view of the messages or calls that you and your staff take, making it easy to monitor. Moreover, these dashboards are often web-based so you can access them using any device wherever you may be and at whatever time you please. Having a VoIP phone system for small business can be a game changer if you want to communicate more effectively with your customers as well as with your teammates. These provide you with all the capabilities of phone systems, instant messaging applications, and teleconferencing programs without the hefty price tag. Moreover, these give you access to more sophisticated solutions such as automated attendants, custom call forwarding, and email integration, making it easier to get in touch with people. Hopefully, with our guide to VoIP applications, you were able to learn more about the different functionalities that you can use for your business as well as gauge which products will blend well with your existing business ecosystem. In case you are still building your arsenal of business tools, you should also note that there are plenty of software out there that you can use to gear your business towards success. This list of SaaS for small businesses is a great place to start browsing.